I wanted the garage renovation. In fact, I think I'm the one who suggested it in the first place. The workers have been here less than a month. They are not technically inside my house. Still, I feel invaded. Husband and I sat down for a quiet first cup of coffee this morning before 8 AM, and lo and behold. A truck full of workers pulled into the yard. It's now 2 PM, and they are still here. It's Saturday, for crying out loud. I know. I should be happy they are showing up and doing the work. I will be so glad when they are done! The room is progressing nicely. It actually looks like a room now and not a nasty garage. The sheetrock is up. The doors and windows are installed. They are mudding the sheetrock today and hopefully will be doing the tile work, installing the cabinetry, and painting by the end of the week. I think the entire room will be done by the end of the week. That will just leave the pole building (which should be started next week) and closing up the door leading from daughter's bathroom to the den to be done. I went button shopping this week and was a bit disappointed not to find much selection. Hancock had the most, but still nothing too special. I ended up buying some lavendar bow shaped buttons and some lady bug shaped buttons for future projects. I found white bunny shaped buttons at Wal Mart for the BSJ. I've sewn them on but still need to block the sweater. I also finished up a spiral rib hat to go with it last night. Pictures will come within a few days--or after I get the blocking done. I also treated myself to these goodies from SchoolHouse Press. 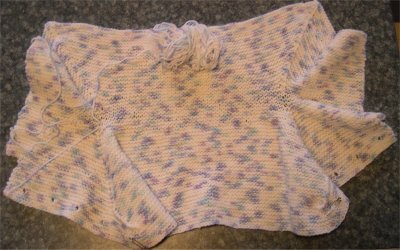 I read about the Baby Surplice Jacket on Knitter's Review and was intrigued by it. The only place I have found the pattern is in Wool Gatherings/Spun Out. Of course I ordered the entire set! Great Big Hugs to My SP! I'm showing you the blank back side of the package. My clever SP placed MY address in the return address spot! Talk about not giving me a clue! However, the postage lable says NY....like that narrows it down any. She could either be using a "bouncer" to mail things or she could be one of the gazillion Knittyheads who live in NY. Hmmmm. I tried to take my time and not rip into the box...savor the moment, you know. 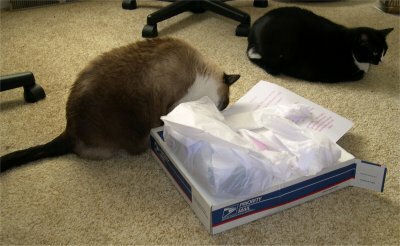 My pal aided that along by neatly tucking everything away in tissue paper. Here's Mocha checking it all out. Socks, on the other hand, wasn't terribly excited. Oh my gosh. I am feeling like the spoiled rotten princess today. Would you look at all these goodies?? First there is a package of my favorite Clover stitch markers. I can always use those! Next, some yarn bobbins. There's a yummy chocolate bar--caramel truffle. Finally, take a look at that yarny goodness. It's soft as a cloud--Malabrigo! I've never seen this yarn in person before. The color is Emerald Blue, and it is absolutely gorgeous! Thank you so much, Pal!! You certainly chose things that suit me perfectly! Did you notice that clever note my pal enclosed in the package? 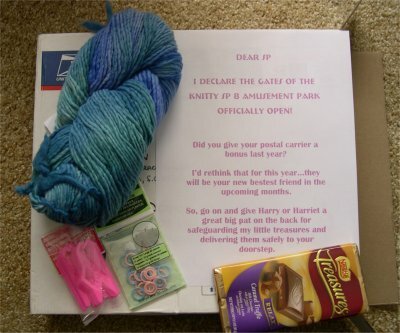 "Dear SP: I declare the gates of the Knitty SP 8 Amusement Park Officially Open. 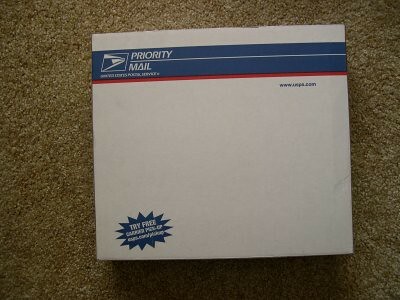 Did you give your postal carrier a bonus last year? I'd rethink that for this year...they will be your new bestest friend in the upcoming months. So, go on and give Harry or Harriet a great big pat on the back for safeguarding my little treasures and delivering them safely to your doorstep." Hmmmmm....who could my pal be?? 100 degrees F. No, that's not the outside temperature; it's my body temp. I'm sick with some sort of nasty something or other--congestion, sneezing, scratchy throat, queasy feeling tummy, just general crappy feeling. Husband is sick, too. Daughter got this thing first, but in typical kid fashion, she seems to have snapped back in just a matter of a couple of days. I wish husband and I were as resilient. Last night I seamed the BSJ. We have to go out tonight (ugh) to take daughter to her social dance class, so we're going to stagger into Michaels to look for buttons. I know, I know. Sick people should be home. Work is progressing in the garage make over. They have a lot of wood framing in place around the duct work, electrical outlets installed, recessed lighting fixtures installed, and a bunch of boards nailed to the walls to attach the sheetrock. It's coming along. I'll be very glad when they are finished! Even though they are not inside the house itself, it is still very intrusive to have strangers present! Yes, the photos are not great, and the sweater is only folded into place, but I had to show you that EZ's Baby Surprise Jacket pattern really does work! I know that many of you believed this without my presenting the evidence, but I didn't!! In both pictures, you can see the yarn I had leftover. My jacket took just about 2 balls of Plymouth Dreambaby. I need to find some buttons for the jacket--I'm thinking little fish or possibly ducks, whichever goes best with the colors--and I have to do the sewing up and weaving in of a couple of ends. I want to watch our EZ DVDs to see her example of finishing. I took careful notes of everything I did while making the jacket. I'm a details gal! I'll post some project specs when I get the finishing done on my jacket. This was a fun knit. I can see why it's so addictive for some people! Maybe before too long, I'll tackle an adult surprise jacket! I have a happy lost dog story to tell you. Back during the first week of the month (on my birthday, actually), husband mentioned that someone had posted a lost dog sign in the neighborhood. The pup had been missing since February 1, and it had been COLD here. 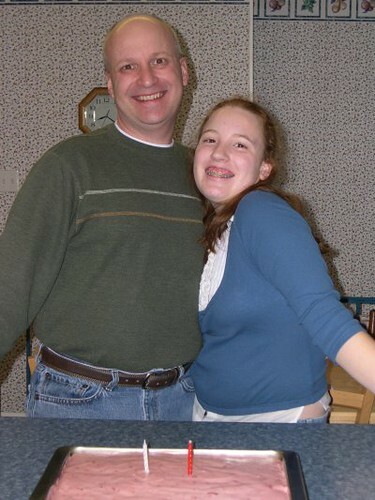 In the afternoon of February 7, we headed out to do an errand and get daughter at school. We noticed a little dog walking down the road about a mile from our house, and husband thought it might be the one that was missing. We stopped and called to her, but she was afraid of us and ran away. We decided to turn around, return to our neighborhood, and call the number on the sign. The man who answered thought it was his dog, and he said he'd drive over to see if he could catch her. We went back up the road and parked so that we could keep an eye on her. Happily, this man was indeed the dog's owner, and he was able to catch her and take her home. A $200 reward was offered, but we refused it. It just didn't set right with either of us to make a profit for someone else's bad time. We were pleased to have been able to help reunite a loving family and their pet and never thought anything more of the reward. Last week, I checked the mail and found a card in the box. I just assumed it was another sympathy card but couldn't guess who in our town would have sent one. What a surprise to open it up and find that it was from Jazz, the little dog we'd helped get home. There was a picture of her and the sweetest note. Also enclosed was a $50 gift card to Outback. We would have been just as happy knowing that Jazz had found her way home safe and sound, but it really was thoughtful of her and her owners to send this gift our way. 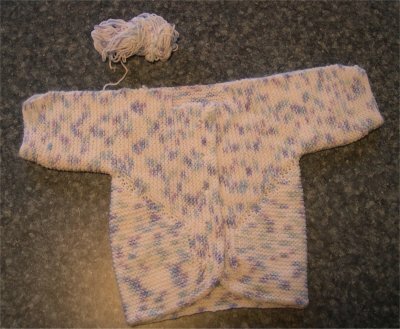 I've worked up the nerve to try knitting an Elizabeth Zimmermann pattern, the baby surprise jacket to be precise. I'm a person who likes things spelled out step by step. It's not that I'm not creative, it's just that I like order. Apparently, EZ did not. She was more a "wing it" kind of gal than I am. I think that's what has put me off her patterns for so long. So far, I have a funny looking sort of bulging rectanagular piece of knitting. The stitches are nice and even, the fabric is soft (using Plymouth Dream Babies) and the colors are pretty, if that counts for anything. I could likely use this thing as a hand towel if the whole origami surprise jacket deal doesn't work out! ha ha! When I bought the yarn for the BSJ, my intention was to knit it for a friend and former co-worker who's expecting her first baby. I wonder if I'm going to have separation anxiety from this project, though? It seems to be taking a good bit of time....maybe I could get away with knitting her a hat and baby socks?? Nah....I guess she'll get this sweater and possibly the hat and socks as a bonus. The construction guys are here again today, whapping hammers and making a lot of noise. Husband has been out to inspect and reports that they are nailing studs to the concrete block walls of the garage in preparation for hanging sheet rock. They got the old garage doors out on Friday and installed two absolutely gorgeous French doors. They have to go back and put in side panels of glass around each set of doors to fill in the space. This will give us plenty of natural light down there, especially in the morning. I'll see what I can do about getting pictures later. Our family believes in getting those pesky birthdays out of the way in record time! I start things off for us on February 7; husband follows along on February 12; and daughter brings up the end on February 13. Of course, then we can coast into Valentine's Day. We celebrated daughter's 14th birthday with dinner out at a nice little Italian place followed by cake and ice cream at home. Here are my sweetehearts posing with their cake (strawberry jello cake). You can't see it in the photo, but daughter got a great gift from us for her birthday. A necklace similar to this one We got her necklace locally, and it looks to be better quality than the photo, but you get the idea. A picture is worth a thousand words, and this picture contains so many things that it must top that thousand word count. The hat and scarf are birthday and Valentine gifts I made for husband with my handspun yarn. The scarf pattern is Yarn Harlot's infamous one row scarf pattern. I liked the pattern. It's so simple and looks good. The hat is a simple ribbed hat. The silver pin was a Valentine gift from husband--a heart shaped shawl pin from Designs by Romi. I have my eye on a few other things at that website! The tiny little sock was a birthday gift to me from husband. 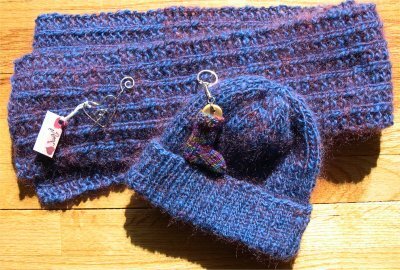 Actually, he gave me the miniature sock blocker key chain and pattern, and I knitted the tiny little sock on tiny little size 0 5 inch long needles! That was fun! We have contractors in the house...well, sort of. We're re-doing our garage to transform it from an outdated, too small two car garage (vintage 1962) into a fantastic, sparkling new (complete with disco ball, I'm told!) second family room. They showed up yesterday and ripped out the ugly vinyl siding slats that served as the ceiling and took out some hideous 1970s era kitchen cabinets that the previous owners had "installed" in the garage. (Did I ever mention that there was lime green shag carpeting on the floor of the garage when we bought the place? The previous owners had taken it out of the house and put it in the garage to keep the concrete clean. What a mess!) The contractors showed up this morning about 9 AM, boss gave worker bee instructions, they backed up a trailer full of brand new wood in front of the garage, told me they'd need money later today, promised to return before long with the full crew, and that's the last I've seen of them. It's almost 3 PM. Hmmmm. I'd be worried, except this guy comes highly recommended and does beautiful work. We are also going to have an old rickety shed torn down and a beautiful 3-bay pole building put up in its place. We'll use that to store the outdoor equipment and husband's wood working equipment. This will leave his 600 square foot workshop open to fiber and fiber alone--all the looms, the picker, the drum carder, etc. I think he's even going to have room for "social" activities with fiber friends. That should be some fun! Edited to add: No sooner had I hit the publish button than I heard a loud crash outside. It was the contractor and crew. They are here to put up the "strips" on which our new sheet rock will go. Our new French doors are here, and they are gorgeous! We talked again about where all the can lights will be placed. He's going to put in maple cabinets in the wet bar area. I'm so psyched! This place is going to look fabulous once it's done. My plan is that this is going to be a teen retreat/noisy den. We're going to have the foosball table, air hockey, and table tennis as well as a wet bar with counter space and a fridge for food. It will be a perfect party zone. Husband swears he is buying a lighted disco ball. Miss Phoebe will also inhabit this area. My birthday was yesterday, and it was rather low key. I spent the day with one of my favorite people in the world--husband. We did some fibery things--picking, drum carding, spinning, and knitting--and that was fun. Well, it was fun until the tip of my left index finger became intimately acquainted with one of the stabby things on the picker. OUCH! I thought I was going to be ill, it hurt so badly. My finger is swollen and bruised today, but it doesn't hurt much. Yes, it was my own fault for sticking my hand where it should not have been. I bought some mohair locks from an e-bay seller last week, and I must say they are a disappointment. The colors were so pretty, but the fiber is way too short to do anything with. We've blended it 50/50 with some wool with little improvement to the mohair. Oh, well. I didn't waste that much money--about $10. I have some absolutely delightful mohair locks from a NC vendor that I saw at SAFF two years ago. These locks were pricey, but they are also heavenly. We picked those yesterday, and I think I'm going to run them through the carder tonight. I promised a photo, and here is one. No, it isn't fiber related. 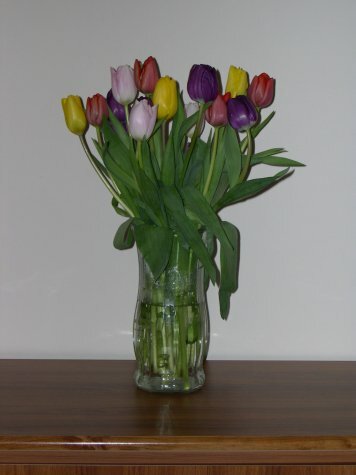 These are tulips that my brother and mom sent to husband to let them know they are thinking about him this week. Aren't they pretty? Mom in law's visitation was Saturday evening, and the funeral was on Sunday. There were so many people at both. It made me feel good to know that so many people loved this special lady. I can't count how many came up to me and complimented how well everything had been carried out with the services. It was most definitely a beautiful tribute to a beautiful lady who so deeply touched our lives. I feel very blessed to have had her in my life for almost 24 years. I still can't believe she's gone. Husband and I are taking the next three days off work just to spend some time together and find some happiness. Our lives have been in a state of turmoil for the past few months, his most especially. I need to be with him, to take care of him a bit. Tomorrow, I think we are going to see FIL and help him get some things organized at the house. I may let husband go alone. It just depends a bit on daughter's school schedule and what needs to be done at FILs. There are things I can help with there, and then there are other things that are best left to husband and FIL alone. I have been knitting a bit lately. The project I'm enjoying most is a one row scarf using Yarn Harlot's pattern. I'm using some of my own handspun for that scarf. I hope I have enough to make a decent size scarf. I'll try to post some photos this week. My mother in law passed away last night. She'd been diagnosed in December with advanced metastatic colorectal cancer. It just all seems so sudden and so unreal. She was the queen of the family, the rock on which everyone else leaned. She was the one who took care of everyone else, and she was worshiped by those around her. My mom in law was nothing like the stereotypical MILs you hear about. She never judged me. She never told me how to be a wife to my husband, a mother to our child. I feel certain that we made choices with which she didn't agree, but she never once interfered. She was not like a mother to me, because a mother would not hesitate to let you know a better way to do something! :-) My MIL was a friend to me and someone I truly loved. I don't think any of us ever expected that we'd lose her at such a young age. She was only 65. There's an empty place in our hearts now that won't ever be filled. I hope mom in law is celebrating in heaven this morning. She's going to be just fine now, and in time, we will, too. We owe her that much.